How to watermark images directly through WordPress? Watermarking of images is done usually by bloggers and website owners, who have original images and fear of those images being stolen and used by others, without any credit. This watermarking is usually done through any software, or any online tools like this Picmarkr online image watermarking tool, but there are a few ways that can make work easier for bloggers using wordpress. There is a wordpress plugin that automatically watermarks all the images that are being uploaded though the media upload section. Its the Watermark Reloaded Plugin. Select the image sizes on which watermark should appear. Select where on image watermark should be positioned. If you chose watermark should be text define how it should look like – Includes watermark text, color and size. The watermark section is previewed there in the settings page itself. You can check it and make the changes, and then every image you upload would automatically see the watermark in it. 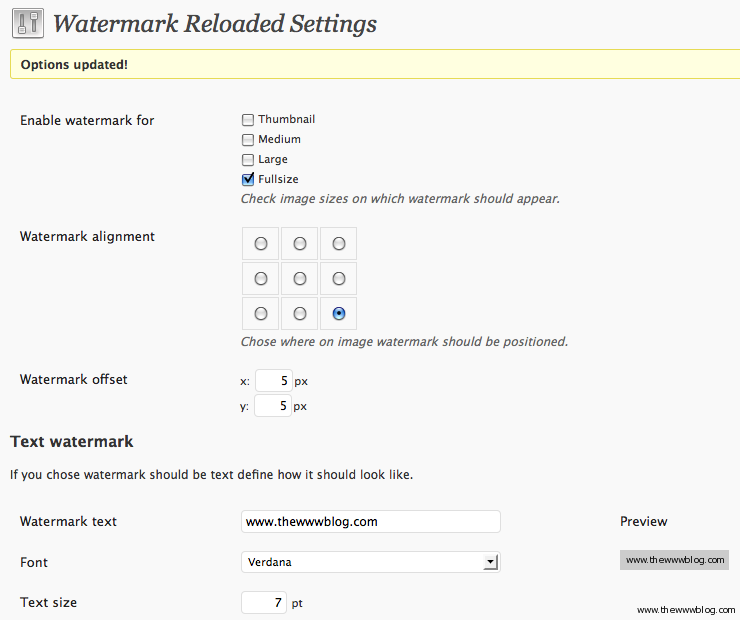 Download the Watermark Reloaded plugin from here. WordPress makes things sooo easy to do! Sometimes we need to use others images then what about the watermark? Will it override it? or erases the old one? hi, i had installed the plugin successfully. however, it doesnt seek to work on the images i had uploaded even i had set the required process. the watermark text doesnt show up.